There is to be one family registered per site (2 adults and their dependent children under 18). All others must pay the visitors’ fee. Please fill out and sign a registration form at the office please. Site Fees are due on or before May 7th. If you will not be around on opening day, please make arrangements with the office, or mail in a cheque to ensure no late fees will be added to your bill!! Must be kept neat and tidy with regular grass trimming around your trailer and fire pit. If you are unable to do this, please make arrangements to make sure the grass trimming gets done. Camp staff can also be hired to do so for a minimal fee. Any site that has not been taken care of regularly, the camp staff will bill you for it to be done. Please ensure that all junk and extra materials around your trailer is cleaned up. Your site is not to be used as a dumping ground. There is to be one camping trailer, one vehicle and one shed per site. Extra vehicles are to be parked in the visitor parking areas. Boat trailers may be kept on your site in a neat fashion. Trailers parked elsewhere in the park will be subject to a storage fee. Please keep your alcohol at your campsite! Do not walk around the campground with open alcohol. There is a nice sandy beach for your enjoyment. * Swim at your own risk – unsupervised swimming. No dogs on the beach. Please clean up your garbage and cig. butts on beach and grass sitting area. Children must be accompanied by an adult when swimming. No rough or horseplay on the raft as there is many young children. Do not allow children to go under the raft, as it is very dangerous!! Keep fires in designated fire rings only. Do not move your fire pit without prior permission. Please keep fires at a minimal height. Check with the office as to where you may dump your ashes. Do not burn anything other than wood in your fire pit!! Burning garbage and plastic is toxic for people and the environment and it stinks!! All construction must be approved by management prior to the start of the project. Projects must be completed in a reasonable time frame. Sheds and screen rooms must be covered with a neutral colored siding and be completed with soffitt and fascia as well. Carports and Shelters are not allowed. A camper run group of volunteers, whose mandate is to plan various activities for the campground to enjoy during the summer. Your help and input is important for its success! *Association meetings are for planning activities only! 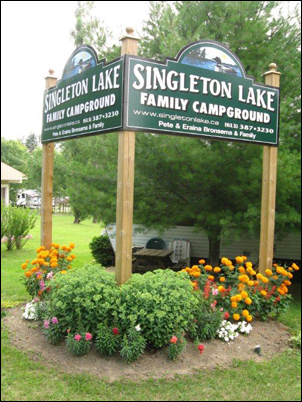 Any campground related concerns should be directed to the office! Personal docks and boat slips on camp docks are available for rent. No mooring at camp docks without permission. Parents ensure that children under 12 are supervised and are wearing a life jacket on the docks! Located by the beach. Everyone must use a hose on the end of the blue boy, putting the hose directly into the holding tank (not the tire ring) while dumping!! Mobile pumping is also available. Pump outs will be done usually once a week. Please sign up at the store. Fireworks are not allowed on the camp property at all. Partial recycling program available. Bins are located by the office. No large items or baggies to be left at the recycling please! Garbage disposal available, $ 2.00/bag please pay at office. NO FISH GUTS to be thrown into garbage bin!! Do not burn your garbage or recycling in your fire pit! Keep your pets on a leash at all times and make sure that the dog does not encroach on other campers. Clean up after your pet!! Don’t throw their messes into the public garbage cans!! No dogs at the beach swimming area as well! Please keep them quiet and respectful!! 11:00pm is strictly enforced!! Please have respect for others and be quiet as voices and music carry. Children and teens must be at their campsite by dark. No wandering around after dark. No swimming after dark. Notify management prior to selling the trailer. When the trailer is sold, the site does not automatically accompany the trailer. Older trailers may be asked to be removed from the park or given one years grace for the new owner to upgrade the trailer. ‘For Sale’ signs must be small and discreet. The fee for selling your trailer in the park will be $250 (if a lot of time is needed showing a trailer to be sold the fee is $ 350), to be discussed with management prior to selling. Trailer selling specifics must be written and submitted to office. On site canteen for ice cream, drinks and snacks – hours will be posted. You are allowed to set up a tent on your lot, as additional sleeping quarters for temporary use only! No permanent tents on your site please! Please ensure that your visitors have registered in the office upon arrival. You are responsible for your visitors, so please make sure they abide the rules of the campground. All visitors’ cars should be parked at the designated visitor parking areas. You must notify the office if you are expecting more than one carload of people. Because we are on well water, there is to be no washing of trailers or vehicles during the summer months. Check with management during the off-season. These are your washrooms, please help keep them clean. No smoking or pets in the washrooms! Parents are responsible for your children; therefore ensure they respect the use of the washrooms as well! This is a private park and management reserves the right to refuse admittance to anyone at anytime.